Some people are quick to dismiss CARS because they somehow believe it’s a movie about talking CARS and its story is “simple.”As if Romeo & Juliet or Butch Cassidy & the Sundance is simple so it must not be any good. (Boy Meets Girl, Two Guys Being Chased). But now, you have ten reasons why you can be a film snob and still love CARS. (or of course, you can be a regular film fan and love CARS … or if you’re a kid at heart but to be an elitist, it must be above emotions – hence Toy Story 3 is also no good at all – what with all that blubbering by moviegoers – what’s up with that?). CARS is really a philosophical debate with inanimate animated objects as a metaphor much like ANIMAL FARM. (No, not ANIMAL HOUSE, a fine movie but different). 10) It is the ultimate humanity triumphs life in a cyborg world. That beneath the veneer of exotic metals, technology and life in a machine world – what ultimately drives us is our humanity. 09) That blindly following the world and path set before you is a path that needs to be questioned. Are you really born as a “race car?” Pushed to that path by surrounding forces? A true destiny? Or believe that its material gains are what you want as part of what society wants – is that the path? Is that the righteous path? Is that your path? Should it be? 07) Does achieving your “goal,” to cross the real or metaphysical “finish line” the ultimate validation? Are you the ultimate winner to drive furiously at all costs with reckless abandon? Does that make you the winner? Or are winners crowned by society? Or are winners crowned by friends and neighbors? Do you win in the heart first? Do we need validation on a winners stand surrounded by cheers? Does that make you better a man-car or is that an unjustified goal? 06) And of course, are you your environment or your inherent inner being? Can you change? Should you change? What spark do we need to change the course of our lives and or history? Are there accidents or do we need to create the need for an event to change the daily course? Is our destiny in the stars or do we make our destiny? 05) In our race for modernity – what do we leave behind? What do we embrace and do we discard? 04) Why when confronted with a new situation, is our natural recourse ‘flight?’ Is our first feeling the best & right feeling? Is that an ingrained belief? Does an external force have to act upon that flight sensation – in this case – being physically detained until … we come to our senses? Or is the reinforced notion that when we are accustomed to a new surrounding, it no longer triggers our flight sensation? 03) Are we already machines with changeable shells? Or veneers? 02) Perhaps one day, you too need to look around and stop, be in unfamiliar surroundings but make the best of the situation instead of struggling just because it is beneath your self appointed station in life – and repair all those those around you – not just physical potholes but emotional and traumatic … and ultimately repair yourself. And perhaps the journey is the reward. 09) The animation is technically brilliant, breath-taking and dazzling in a world where we thought we’d see it all. After 5 years, it’s still awe inspiring. 08) The characters are true to life and more real than 95% of “real” movie characters and 18% of the people in my life. 07) It’s got talking cars in it. 06) It’s entertaining after 25 viewings. 02) It’s laugh out loud funny. 01) Um, what’s not to like? * Only if you like movies, good storytelling and-or are a kid at heart. ** Only if you like laughing. 09) We should’ve had about 2 sequels by now. 08) Stupid CARS LAND is not open yet. 07) Instead of shutting down Pontiac, GM should’ve started selling McQueens with eyes road cars (though never lenticular). 06) CARS 2 is not out yet. 05) There are ************* ****** ****** that don’t understand CARS. 04) I can’t think of 10 things I hate about CARS. Loving this post! It would have to be one of my fave’s Met! Met’s analysis is spot on. What I love most of the film is not only how it questions you on a personal level but also questions societal issues in many ways too. Met pointed to this and if you look at many of the other characters and their interactions it is quite clear in many instances. 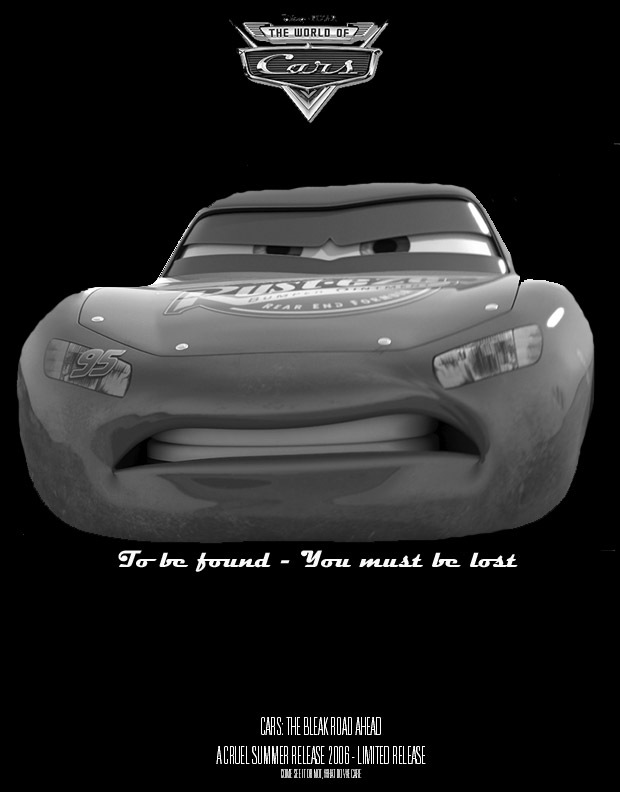 For example, McQueen tells Mater “I hate rusty cars” and then realises the impact of such a statement. The words “rusty cars” could mean so many other things in a non-cars world. There is also the way Harv expects McQueen to behave especially when he is telling him to leave Radiator Springs. Then you simply have the whole of the Radiator Springs townfolk and their sad situation. All the other Pixar movies work in very similar ways. They have a great formula for making movies (not just cartoons, as imho many Dreamworks and other similar movies are poor). Annoyingly, many of the typical Hollywood blockbusters spend more money on CGI and special effects rather then plot and character development. Think Transformers here! Though Pixar may be using groundbreaking CGI, in 10-15 years when this technology is outdated I am hoping to be still watching these Pixar classics because they had such good stories. One actually only needs to watch Toy Story and Toy Story 3 to see the difference here (in CGI) but no difference in telling such a brilliant story. Here is to hoping Pixar can continue their fine work for a long time. Believe it or not, I tried to be very brief! I love Pixar movies because they are beautifully and artfully made, from the story, to the writing, to the graphics, to the music. They are fun for kids, yet entertaining for adults. What person with a beating heart doesn’t appreciate that moment in Toy Story when Buzz finally realizes he cannot fly, he really is “just” a toy? Who didn’t cry during Up when the entire life story of Carl and Ellie was told without a word being spoken? Cars is a classic tale told in an imaginative way and it never gets old for me. I have been holding off watching it for quite a while now so that I can see it again with fresh eyes (and in high def yeeeeaaaaah!). Not to mention WALL-E, where not a single word is uttered for the first 39 minutes of the movie, but Pixar makes you understand EXACTLY how WALL-E feels about Eve? I think that movie is absolutely brilliant. Those two robots only have their expressions (and limited ones, at that!) to convey their messages, but yet it’s crystal clear what is going on. Pixar RULES! Can’t wait for CARS 2. PS – I can’t wait to add another 200 different versions of McQueen to our collection!!! 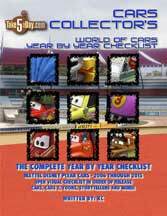 PPS – And I would sell our entire collection for a 1:1 scale version of Lightning McQueen! Could you imagine pullin’ up to drop of the kids at school in that!!! ALRIGHT!!!!! The thing is many people around the world love the movie, characters and Cars. Not to mention all the other merchandise and the family and I love the whole Cars world too. So who really cares how many people like it or not? I never care how many people like something or what “popular opinion” is. I like what I like and think for myself. We love Cars so it’s good for us. Whoever doesn’t like it or thinks whatever that’s cool. Everyone has their own thing. Everybodys right and nobodys wrong. However speaking of popular: Cars has sold the highest amount of merchandise of any single movie in the history of Disney. Can’t be too bad. When I was talking with Lee Unkrich he said that they always get comments that they lost their creativity when they do sequels. They also mentioned that they have about 40 minutes completed of Bugs Life 2 but just don’t know how to end the movie so it’s sitting on a shelf. Unreal!! They could just cut to black at the end and roll the credits, a la “Inception” and countless other movies. Toy Story 2 and Toy Story 3 proved otherwise in the loss of creativity area. Those were both very creative movies in themselves! Wow a good start on a doctoral thesis! In spite of all the elitist comments and negative reviews on the net, 5 years down the road, we see new people and their children discovering the movie. Now there’s a great movie theater tie-in next June: Cars Raisinettes — Raisinettes shaped like Cars characters! CARS -shaped Raisinettes might be hard to pull off — you’d need to start with a CAR-shaped raisin — but CARS-shaped fruit snacks have been around for a while! I combust therfore I exhaust.